George Richards is an interesting name from the past. 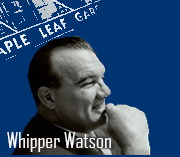 Famous for his Big and Tall clothing shops which catered to athletes and big men, including many of the Toronto smart dressers including Whipper Watson, Pat Flanagan, and Athol Layton. Before opening his chain of stores Richards was a pro wrestler here in the 1930's and '40's. Born in 1914 he had taken up wrestling to help support his family after his father died. When Maple Leaf Gardens opened in Nov 1931 the teenage Richards was selling programs at the arena he would later wrestle in. He went pro in the early 1930's and in addition to the local scene he traveled a bit working around New York and Ohio (as Benny Stein) alongside fellow Toronto stalwart Jerry Monahan. Here he was mostly a prelim type guy wrestling on the openers. One listing in NJ has him (if he is Benny Stein) wrestling Gino Garibaldi. 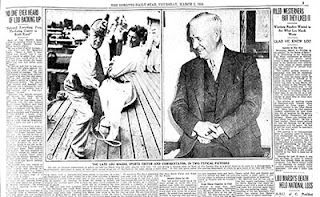 In 1936 he tried his hand at boxing and entered into the Jack Dempsey 'White Hope' tournament under the tutelage of Ed Kellar who had competed in the 1930 British Empire games in Hamilton. 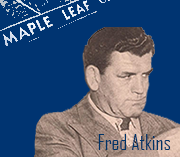 During World War II he enlisted in the Air Force and helped to train troops on the ships going from Halifax to London. On the return trip he'd be in charge of German prisoners of war coming to Canada. 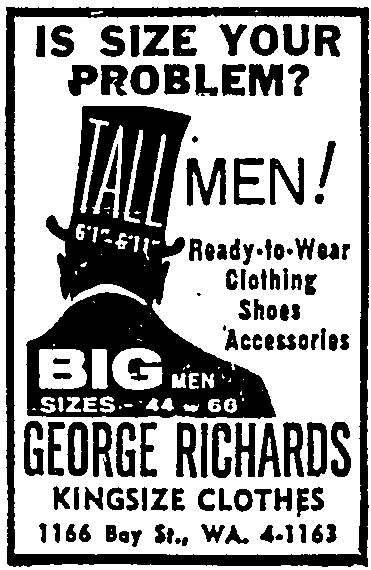 After the war he opened his first store and noticed he was seeing a lot of his athletic colleagues so started catering to men taller than 6'1 (sized 38-60) and to stout men 200-450lbs (sizes 42-66), It was in an instant hit for football players and of course the wrestlers who were now able to get quality suits in their sizes. Athol Layton who was 6'6 265 wore a size 52 tall and appreciated the bright colors, shirts in pink, lilac, and chartreuse. He was one of the snappiest dressers among any athlete both on TV as a commentator and at the many charity functions he appeared at. . It wasn't exclusive to athletes, some of the city's more famous 'stout' men were customers including former police chief Harold Adamson (6.2 210lbs) and Sam Shopsowitz of Shopsys -the hot dog king (5'10 270lbs). Shopsowitz once said about Richards suits 'The fact that I'm fat doesn't mean that I don't like to follow fashion trends. I object to elephant pants but I like patch pockets on my suits' indeed! 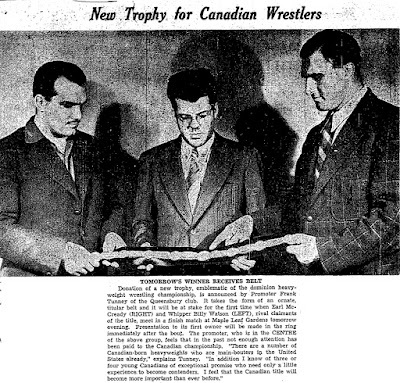 In 1954 after the Toronto Tag Trophy (sponsored by Calvert Distillery and dubbed the Calvert trophy) was destroyed by the Mills Brothers, Richards donated a new trophy to be awarded to the Tag champs - the George Richards Trophy which was awarded through the balance of the 1950's. George was still leading exercise classes for seniors into his mid 80's and at 87 (2002) was still working out 4 times a week. Was unable to find a date of death, if anyone can help please contact me. ... enjoyed it (George Richards post) as old memories of the days when I worked out at the Bloor St. YMHA. came back. Alfie Richards, who was George's younger brother was in the weight room on a regular basis, he was a big guy, and so were some of the guys that he had workouts with, he was friends with Les Lyman (promoter/wrestler), who also occasionally worked out at The YMHA.. I remember the time when Alfie invited myself and a friend that I worked out with to be seconds at a wrestling show that he had a hand in. Insofar as Alfie Richards being an active wrestler, no don't believe he ever was, I'm thinking that he worked in men's fine clothing sales, as did his older brother George. Roger also sent over a photo of Alfie Richards wrestling with Les Lyman on a mat at the YMHA. Richards clad all in black. It sent me looking through some ads from shows that Les Lyman promoted around Toronto in the mid 1950's. On some of those shows, one 'Blackjack Richards', Roger remembers 'Killer' Jim Conroy on those shows too. 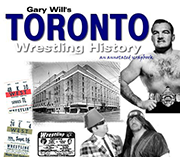 This is a 'Sunday Night' feature... We have looked at the various anniversary shows held at Maple Leaf Gardens over the years, this time we focus on the final one, celebrating 50 years of wrestling at MLG. The first show was held on Nov 19 1931 under the promotion of the Queensbury Athletic Club headed by Jack Corcoran. 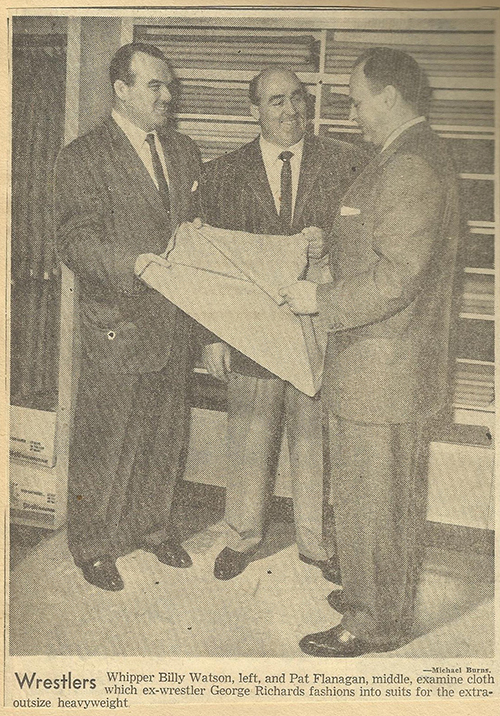 Corcoran passed the promotion to John & Frank Tunney in 1939 but in later days Frank said he had started working for Corcoran in 1931 and was around the night MLG officially opened on Nov 12. In fact he said it was notable also as it was his 19th birthday. Frank had gone off to college in Feb 1930 and settled in as Corcoran's secretary for those early years. When his brother John passed away suddenly in 1940 Frank took over the reigns for the next 43 years untill his death in 1983. 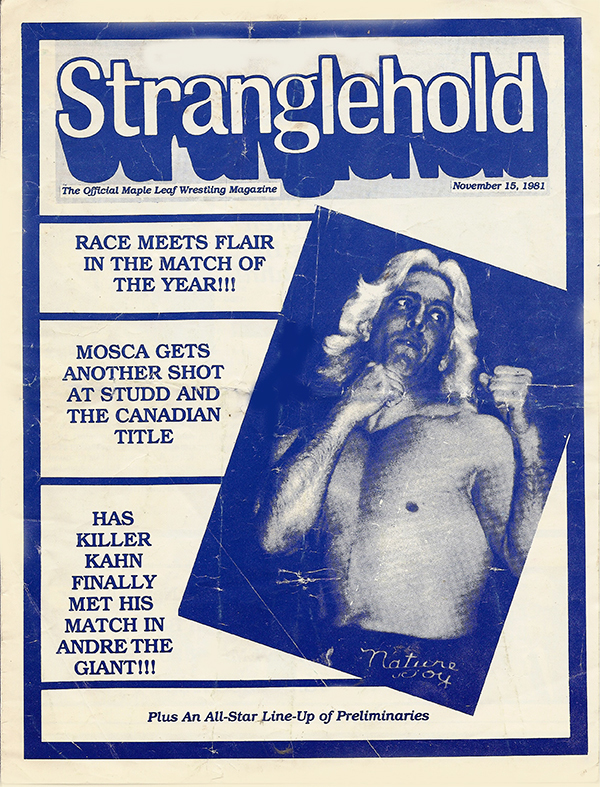 The show was planned for Sunday Nov 15 1981 and was to feature an NWA title bout with new champ Ric Flair defending against #1 contender Harley Race. At that time newspaper coverage was minimal as compared to previous eras, but this anniversary earned a couple notable entries in the dailies. 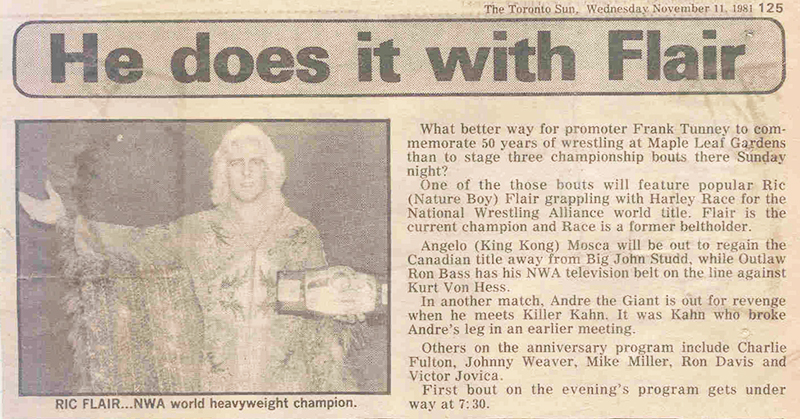 The Toronto Sun had an enlarged ad type entry on Nov 11 with the caption 'He does it with Flair' with a photo of the new champ and his belt. It was billed as 3 championship bouts, Alongside Flair vs Race, Angelo Mosca trying to regain his Canadian Heavyweight Title from John Studd, and NWA TV champ Ron Bass to defend against Kurt Von Hess. Added to that was Andre the Giant going for revenge against Killer Kahn for breaking his leg (actually happened well before and the two had had several return bouts elsewhere) and 'others' including Johnny Weaver, Mike Miller, Mike (billed as Ron) Davis, and Victor Jovica. The Globe had a feature article by James Christie (40 years at Globe as Sportswriter) entitled 'Love and pain and 50 years of grappling.' He looked at the history of wrestling here and quoted Tunney as saying he would sell out the show expecting 17,000 and a gate of $100k. The card did almost sell out MLG, announced attendance was 16,000 which made it one of the best of the era. Since 1974 there had only been two other cards over 15,000. The place was full, and loud. The card itself did not disappoint, though there were some minor changes from what was scheduled. About to hit the ramp! The highlight was Flair vs Race , 24 minutes of suplexes, figure fours, falling headbutts, and all out action both in the ring and on the ramp. As was usually the case when these two met both were covered in blood after sacrificing themselves on the hard wooden ramp. 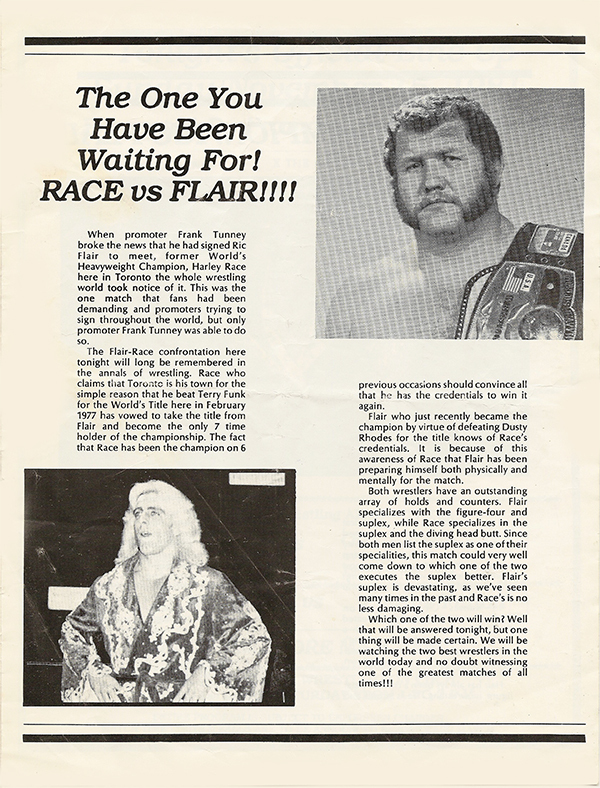 Race appeared to pin the champ when ref Terry Yorkston counted Flair down for 3 and the fans thought we had seen another title change in Toronto. Ref John Laing came out to tell Yorkston that Race had pulled Flair's trunks. During this exchange Flair got behind Race and threw him into the ropes catching him in a cradle and pinning him. Flair was declared the winner and wrestlers from the back came out to congratulate him. Race blew up and laid out Mike Davis before piledriving Flair into the mat. Race continued to attack until Johnny Weaver grabbed the NWA belt and swung it around until Race departed down the ramp after which Weaver and Davis helped Flair off to a huge ovation. That was their 2nd of 6 bouts here over the NWA Title between 1980-1984, each as champ for 3 bouts. Flair who was popular here all of the time since his switch in 1980 always earned the cheers while mostly a heel in other areas. Even as a full fledged heel here in 78-79 the fans loved him and he would always draw them in when he made his return here as NWA champ, 10 defenses total 1981-1984. The only downside of his NWA runs was that we saw him less often. The Andre- Kahn bout was also a hard fought, very realistic and rough battle. Andre looked to be killing Kahn before Miller, Fulton, Slapowitz, and Vines rushed out and dragged Kahn away from the angry Giant. Andre had Kahn on the ropes trying to break his leg and wouldn't let up so officially a double dq. Mosca and Studd continued their feud with two referees and brawled their way to the floor where Studd had had enough and fled to the dressing room leaving Mosca the winner but not the champ. Mosca would eventually regain the title a few months later in a cage bout. Those 3 bouts were worthy of the card and the openers were pretty good, including the only appearance for Slapowitz. 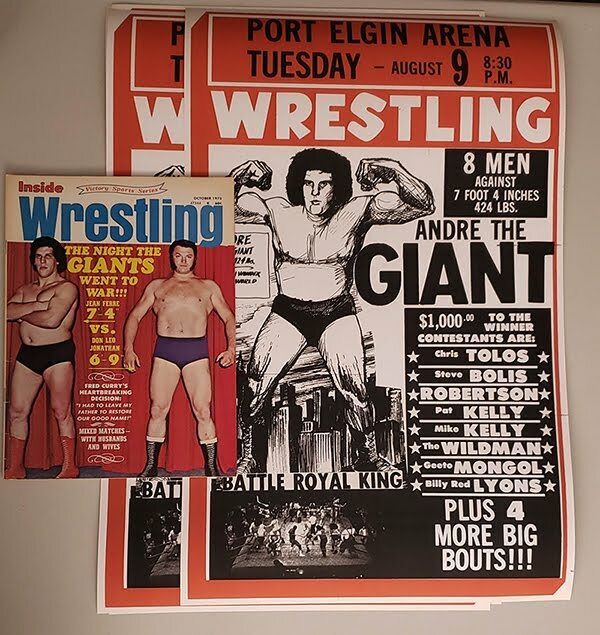 Some of the wrestlers appeared in Brantford for TV tapings the following day, notably Race who wrestled 3 bouts for the day. 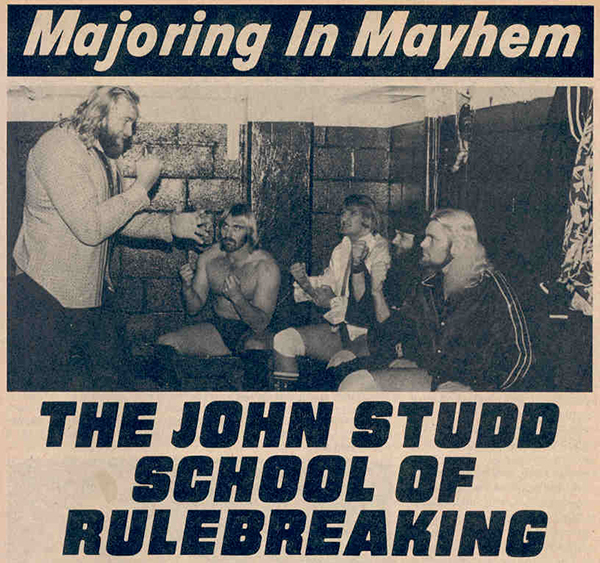 The card got some write ups in the magazines of the day including an 'Arena Report' in PWI, 'The Wrestler' had a' story entitled 'The John Studd School of Rulebreaking' - Studd mentoring Slapowitz, Miller, Davis and a great shot of the old dirty Maple Leaf Dressing room, and a 2 page spread in 'Ring' Magazine. None of the bouts from the 50th card have surfaced, I have a hazy memory of seeing portions of the Andre-Kahn and Flair-Race bouts on the CITY TV Monday 6pm news, likely repeated from the Sunday 11pm news where they usually showed it - we wouldn't have been home in time for that and I didn't have a VCR till about '83! The legendary sportsman Lou Marsh was a mainstay on the Toronto scene as an athlete, referee, and journalist for many years. You could write a book on his exploits and accomplishments but we will look at his close connection to pro wrestling in the city. He was involved from the very early days as both a referee and then covering the sport on a regular basis as a reporter for the Toronto Star. He was a tell it like it is type and could be critically honest in his views of the sporting world. He demanded utmost participation and effort and his view of pro wrestling was no different. 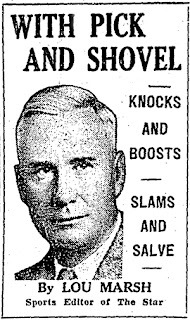 His column in the Star titled 'With Pick And Shovel' (and later as Sports Editor) frequently covered the sport and as a referee he had a unique perspective on the going ons in the squared circle. Marsh was an early supporter of boxing promoter Jack Corcoran and his Queensbury Athletic Club who later got into pro wrestling before passing the office to the Tunney Brothers. Marsh and Corcoran ran in the same circles hunting and fishing together. They had both served as judges for amateur trials held across the county in the 1920's and Marsh frequently served as ref on Corcoran's boxing cards. A couple of weeks later on the eve of Corcoran's second card featuring Jon Pesek Marsh opined that the first card which had been plagued by 'razzers' were in fact a 'paid clique' sent to disrupt the card on behalf of others (presumably rival promoter Ivan Mickailoff). He said it was openly charged that the hecklers were paid 25$ to start trouble at Corcoran's debut and that the same parties set up a pair of double crosses on the same show. He retired as a referee several years later though he would occasionally come back for one-offs, some at the Bowmanville Lions Club. Corcoran had more than once offered Marsh as much as $500 to ref a bout in Toronto. it would have made for some publicity as Lou didn't like modern wrestling and the public knew it. Marsh always refused. Just a few weeks before Marsh passed away suddenly in 1936 he had reffed at a Corcoran charity show in Hamilton. 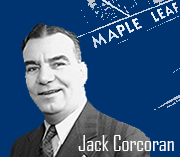 Corcoran had asked and Marsh offered to do it only if Jack worked one bout as well, so they did. In late April 1936 Marsh was having a bite at a cafeteria and suffered a cerebral hemorrhage. Initially they thought he would recover but on Mar 4 suffered a fatal stroke. Upon his death Corcoran related several anecdotes including crediting him with saving him when their canoe turned over on a fishing trip. He was said to have saved close to a dozen people from drowning over the years. 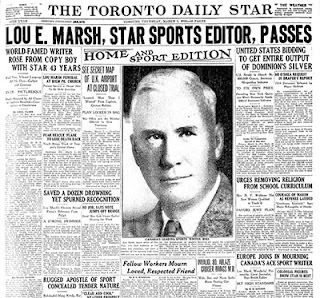 Marsh was so influential and respected the Star devoted all of its cover and most of its first 4 pages to him when he died. They named an award after him to be awarded to Canada's top athlete each year starting the year of his death. 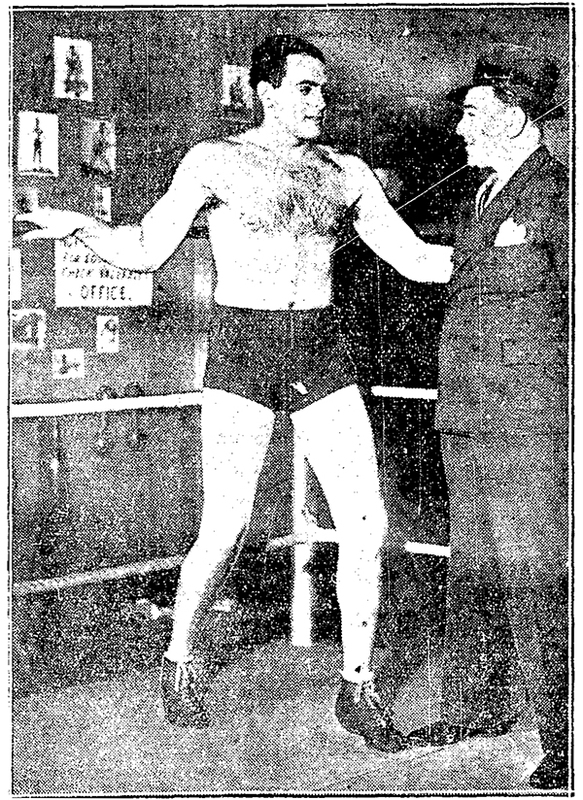 No pro wrestler has ever won it but in 1953 Doug Hepburn won it for weightlifting. 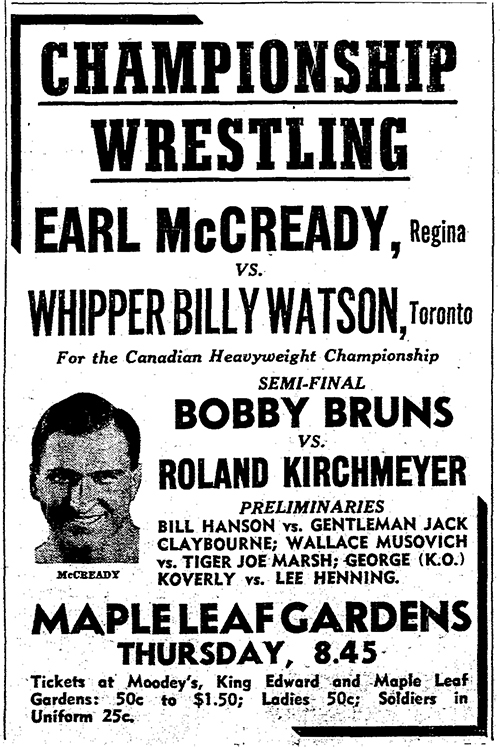 He had a brief tenure as a pro wrestler here in Toronto in 1955, we looked at him in another entry here on the site. This was the beginnings of the British Empire Title which became the main title here for close to 30 years. McCready had come in to Toronto as holder of both the B-E Title and the Canadian Championship and had faced Whipper the week before this bout. In the mid 40's McCready owned a farm on 2nd Concession in Whitchurch Township (Vandorf) near what is now Aurora. He would be gone for 6 months at a time traveling around the world and was known for a time as 'The Whitchurch Farmer. 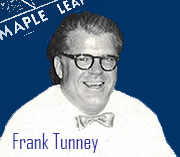 In a 1944 Stoufville paper it proclaimed Frank Tunney as the second most well known local name in pro wrestling - next to McCready. 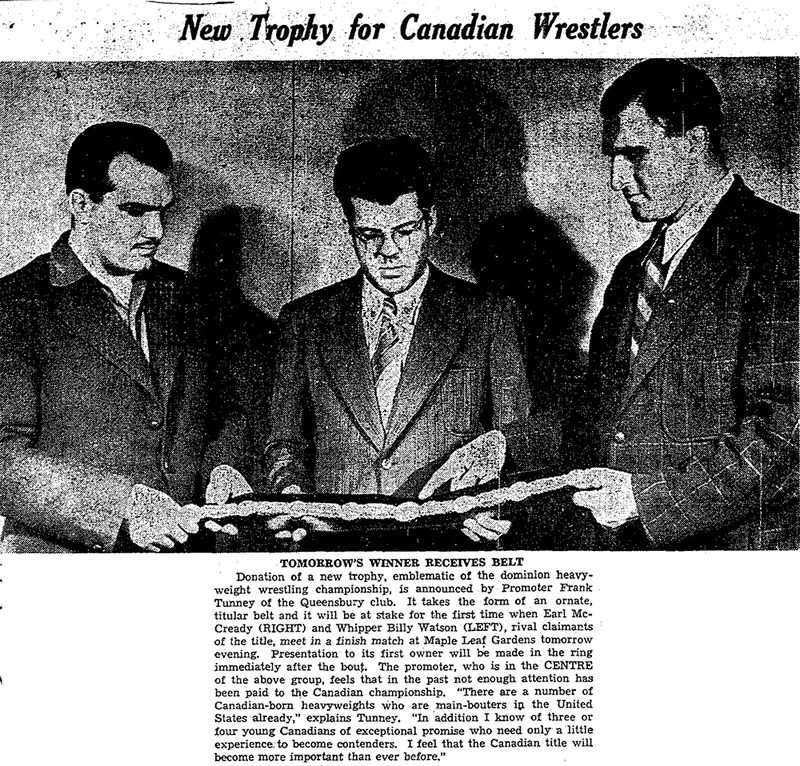 In June of 1941 rookie promoter Tunney introduced the new title belt 'emblematic of the dominion wrestling championship' in order to give more credence to Canadian wrestlers. 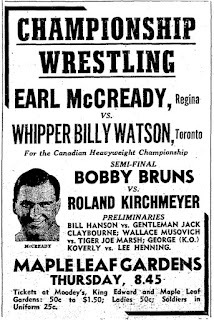 McCready was still billed across the nation as champ and Tunney deemed local star Whipper Watson to be a claimant so the two were set to meet at MLG. The initial meeting was inconclusive but in the re-match McCready pinned Watson in the 5th round of another 8 round bout to become undisputed champ. Both were said to be competing for the chance at the World title so it helped to establish Watson as a worthy challenger. The new British Empire title would then become the centerpiece for the next decade and provide a platform for Whipper to eventually attain the World Title. McCready would lose the title to Nanjo Singh who then lost it to Whipper for his first run in Apr 1942, McCready would regain it from new champ John Katan late in the year and by 1943 Whipper would regain it and hold it on and off (mainly on) before it was retired in 1967. McCready and Watson would also find time to team up as a formidable tag in 1942 in a bout billed as the 'first time four men in the ring at the same time.' Our era's Texas tornado bout. The two would beat John Katan and Al 'Bunny' Dunlop in a wild bout. McCready would continue to appear often through the 1940's while still maintaining a busy schedule throughout the wrestling world and would wrestle his last area appearances here in 1954 before finishing his career out West. *note in the photo above with all three, McCready who was billed at 5'11 looks to tower over Whipper (billed 5'10) (and Tunney -5'9?) , there is an entry on the web that claims Watson was 5'7 but photos show him to be about 5'10. Another photo shows them to be about an inch apart, must be the angle of this one.